Bucks Survivor: Round Four ~ The Bucky Channel - The World of Sports from Wisconsin's Perspective. 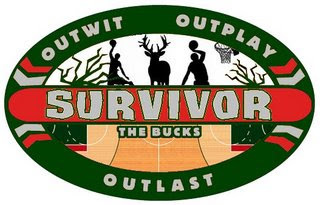 First off, I would like to thank all of you that have participated in Bucks Survivor so far this season. Secondly, where the hell did you go? Normally this is the case, where the first edition draws the most votes and then from there the low vote totals reiterate just how sorry of a blog this is. But hey, all it takes is one vote to eliminate someone, so as long as you keep voting Mom I'll keep doing this. Last Week: The challenge was scoring average in the playoffs, a challenge which may or may not have been rigged in order to but the Young Bucks on the chopping block for a change. The strategy worked, as the Veterans finally won their first challenge. Brandon Jennings received immunity, and seven players were left to fight to survive. Sadly, we will be saying goodbye to Charlie Bell, who had five more votes than Darnell Jackson. The same Darnell Jackson who appeared in just one game for the Bucks this season, and the same Darnell Jackson who I have to check the Bucks roster everytime I write his name because I can never remember it. But seriously, who the hell voted for Ersan Ilyasova? This Week: Great challenge lined up for this week, let me tell you. Sometimes in life you get what you deserve, and other times it's all about luck. This week, it's all about luck. Ready? Heads, the Veterans win. Tails, the Young Bucks win. Heads it is. Veterans win, and the Young Bucks are on the block. Let's give Andrew Bogut immunity as a sign of our appreciation for coming up with Squad 6. What a compelling challenge, no? Voting: Choose which Buck you'd like to see kicked off of Bucks Survivor by voting in the poll at the top right of this blog. Voting will go from now until Tuesday night at 6pm. Tell your friends.